Find Missing Dylan Redwine Just to clarify ~ when search and rescue arrived to search for Dylan on that first day and the next day, there was not a pillow or blankets. The family had to bring 4 bags of Dylan's things from Colorado Springs so the dogs could have a scent almost 10 days later. Couldn't the dogs smell whether he was ever at that house? I don't know a lot about it, but I would think so. The spokesman for La Plata County speaks as if it's a given that Dylan was there, but I'm not convinced of that. And I don't believe he got up the next morning, packed up everything and left without contacting anyone. "He either left the house and someone abducted him or something happened while he was still at the house. I could not think of a 3rd possibility," said Dan Bender, spokesman from the La Plata County Sheriff's Office. KUSA - Dylan Redwine's 14th birthday is next week, but his family is planning a vigil instead of a party. The teen disappeared Nov. 19, 2012, from the Vallecito Lake resort area in southwestern Colorado. "They need to look at everybody," said Mark Redwine, who was the last known person to see Dylan. "Dylan is not here," said Dylan's mom, Elaine Redwine, in a separate interview. "We don't know where Dylan is." "I'm not interested in blaming anyone," Mark said. "I think once we find Dylan it will bring all the answers to the questions we don't have." "I would never do anything to harm that boy," Mark said. "I know they are looking at me for being involved at some sort of kidnapping scheme, which is one of the reasons I want them to look closely at me. The more they look at me, the more they are going to realize I have nothing to do with this." "I wish I did because then he would be home," Elaine said. "I mean, I wish I could relive that day and do things a lot differently. I had absolutely nothing to do with his disappearance." The Redwines do have some history of family violence. Dylan's older brother Cory claimed that several years ago Mark took them. "He took me and Dylan once or twice and would not tell us where my mom was at," Cory said. Mark Redwine's first wife Elizabeth made similar accusations. 9Wants to Know obtained a police report from 1990. It alleges Mark failed to return their kids on time after visitation and claims he made statements about not returning the children. La Plata County Sheriff's officials say they are aware of the old claims, and they say these kinds of things are common during custody disputes. "The only possibility that we've ruled out due to the passage of time is that Dylan is a runaway," La Plata County Sheriff's Office spokesman Dan Bender said. His dad took him to a nearby Walmart where he was captured by security cameras at 7:05. At 7:22, they stopped at the Durango McDonald's. Mark says he last saw his son at 7:30 the next morning. He said he planned to drop Dylan off at a friend's house on the way, but Dylan was still snoozing when it was time to go. Mark says he handled a payroll issue at his company's office and met with his divorce attorney, and when he got home at 11:30 a.m. Dylan was gone. Investigators say Dylan's cell phone has not sent out a signal since he vanished. A black Hurley backpack, containing all the clothes Dylan packed for his Thanksgiving visit, also disappeared. "For him to just take off walking or be abducted or whatever it's like - with a backpack?" questioned Elaine. "Then to find nothing up in that area, not a sock, not anything that belonged to Dylan? Very strange." "When Dylan left, did he take everything because he knew where he was going and who he was with?" Mark wondered. Dylan's friends say that he had hitchhiked into town before, but no one remembers seeing Dylan along the one county road leaving Vallecito Lake. Investigators searched Mark's house and trucks. They looked through phone records and gave him a polygraph examination. They also took computers to search from Elaine's home in Monument and gave her a polygraph test. The Sheriff's Office has not released the results of those searches and tests. There's also a video at that link, if you missed it live last night. An East Mountain group is reaching out to a Colorado family who has been searching for a missing teen since Thanksgiving. Wendy Kessinger and her organization K-9 Forensics are offering to help the Redwine family search for Dylan. Sadie is the newest member of the bloodhound team - and she's trained for the task. "I can't even imagine what they go through at night knowing their loved one is out there in the dark, in the cold," said Kessinger. K-9 Forensics has worked with local, state and federal law enforcement searching for missing people. Kessinger says the Dylan Redwine case has really touched her heart. "We have the skills and the ability to give closure to this family and if he's there I know we can find him," said Kessinger. Kessinger say her bloodhound Sadie is one of many, and the team is ready for this search. Kessinger wants the Redwine family to know they're willing to search and continue it - even if law enforcement call off their search. The organization has no fee and is on standby - ready to act if asked. "When we do give a family closure it is bittersweet, but you know they can at least sleep then at night and have peace again," said Kessinger. We wanted to know if after more than two months, the dogs would be able to pick up a scent. The Redwine family did not respond to calls for comment. KOB Eyewitness News 4 is getting response from Dylan Redwine's family over a story you saw Thursday night only on KOB 4. Wendy Kessinger and her organization K-9 Forensics made an offer to the Redwine family Wednesday night on KOB 4: To search for 13 year old Dylan Redwine - free of charge. Kessinger introduced us to Sadie, one of the team's many hounds. The message made its way to Redwine's mother, Elaine, and her fiance, Mike Hall. "Elaine and I watched that together and we're just so grateful that people like her are willing to help and so I reached out to KOB to put me in contact with her," said Hall. KOB 4 helped make the link between Dylan's mother and Kessinger. The family told us the past two-and-a-half months have been very difficult - that's why they are so thankful Kessinger came along. "Elaine see's people like this reaching out and it just brings here to tears that everybody is so willing to help," said Hall. Kessinger says she is planning to meet with the family and put together a plan to find Dylan. "This story has hit home with a lot of people and you can see it hit home with Wendy and we're just so grateful as a family that there are people like her out there that are willing to help us out and bring Dylan home," said Kessinger. Dylan's father, Mark Redwine, also called KOB 4 after our story aired. He says he is grateful for Kessenger's offer and is eager to work with her. He says he will do anything to find his son. KUSA - When a child, like 13-year-old Dylan Redwine goes missing, the clock starts ticking. Every hour that passes brings less of a chance that the child will be returned alive and well. Redwine has been missing from the Vallecito Lake area in southwestern Colorado since Nov. 19, 2012. 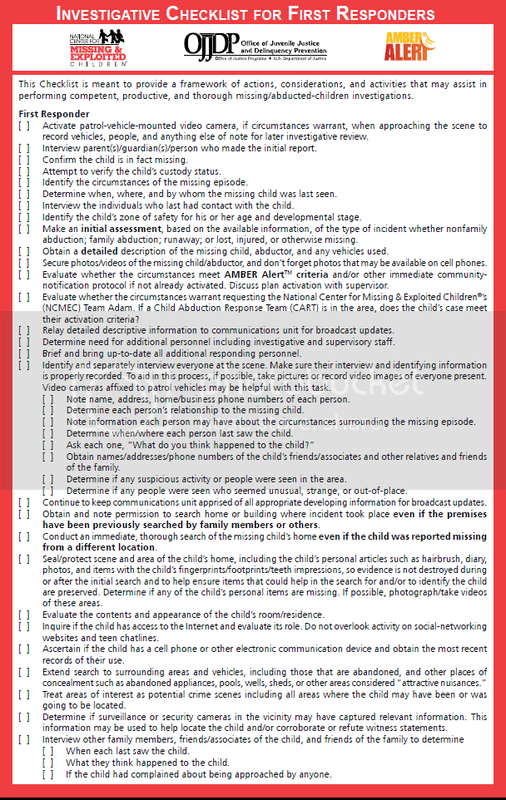 "The first thing you do is basically conduct the investigation as if it's the worst possible situation and let the terms of the investigation determine which direction you go to," said Bob Hoever from the National Center for Missing and Exploited Children. 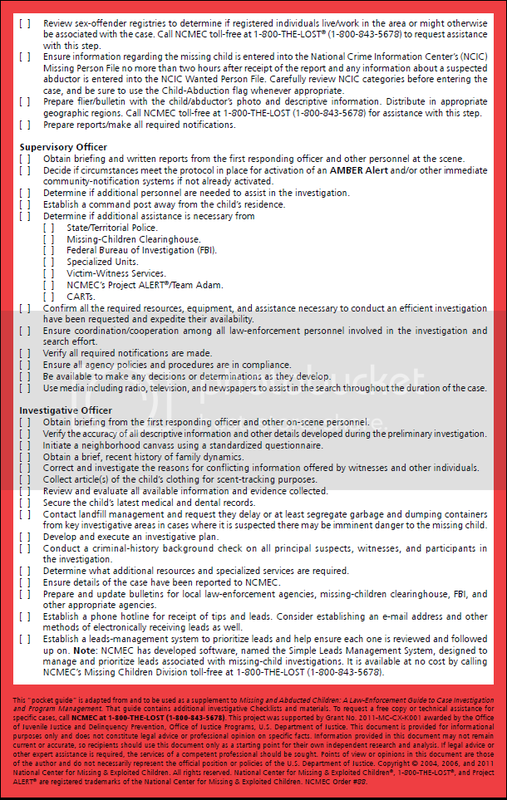 The center has created a task checklist for investigators to use so they don't miss any clues. "If we know the child has vanished from a certain area, we'll start stopping cars," FBI Special Agent Dave Joly said. "We will start knocking on doors, checking businesses, looking at video, anything that can provide us a step in the right direction. Experts say abductions by strangers are rarities. More often a relative, family friend or neighbor is the perpetrator in an abduction. As for the Dylan Redwine case, investigators won't tell 9Wants to Know all they are doing to find out who's responsible. However, they did answer some additional questions this week. They say they have searched activity on electronic devices including Dylan's missing phone, although they will not be specific about how many devices they searched. They also say that they asked Dylan's mom Elaine to bring some of his personal items from her home in Monument so search dogs could pick up Dylan's scent. 9Wants to Know asked why investigators did not try to obtain a scent off the pillow Dylan supposedly used the night before his disappearance. A sheriff's office spokesman said it was likely several people's scents would be on a pillow, and they get better results if they can guarantee a single person's scent. Kidnapping case experts encourage community members to keep circulating fliers about Dylan Redwine's. "It's like trying to find a needle in a haystack," Hoever said, "and the more eyes and ears you have the smaller the haystack becomes." Investigators will be sorting through new tips in the disappearance of Dylan Redwine after a 9 Wants to Know investigation into the case of the Colorado teen who vanished over Thanksgiving week. Investigative reporter Melissa Blasius has been tracking the latest in the case and getting answers to your questions. Melissa, what's the latest? 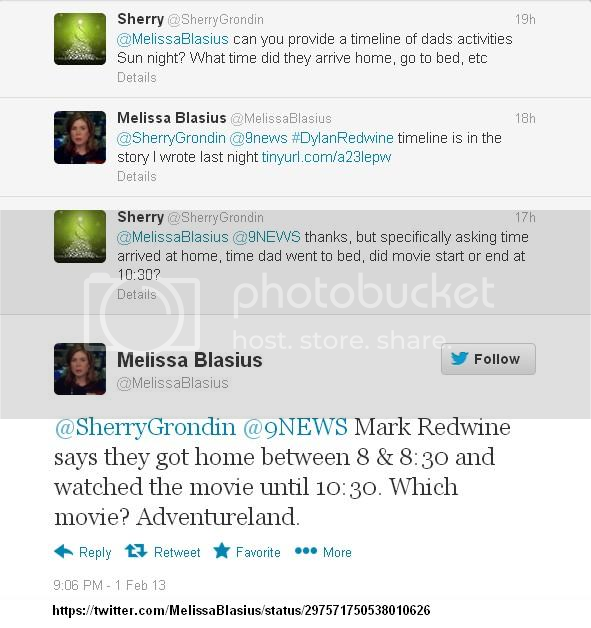 Melissa Blasius: Mark, one viewer asked me if Dylan's dad, Mark Redwine had taken a lie detector test in this case. He did but today or he has told me that it was inconclusive and that he would be willing to take another if investigators want. 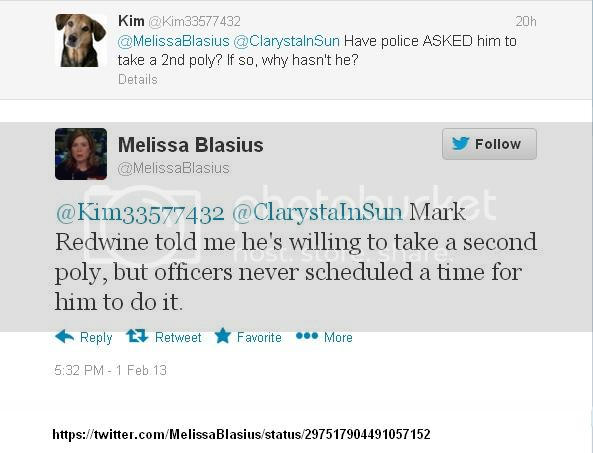 We should also mention Dylan's mom, Elaine told 9 Wants To Know that she took and passed her polygraph test. Mark Redwine has not issued a reliable denial in the involvement in the disappearance. He was asked directly and did NOT issue a reliable denial. He avoided past tense and reliability. Both parents were asked the same question about having anything to do with his disappearance. it does not appear to be judicial or criminal guilt, rather maternal guilt. The 9:37 PM text was the new info that released a couple of days ago. Why was it not released previously? Who did Dylan text at 9:37PM? Did cell phone pings indicate Dylan had arrived at his father's home? If not; where was he at 9:37 PM? According to a new timeline released by the investigators, Dylan arrived at the Durango airport at 5:46 p.m. on Nov. 18, the night before he vanished. His dad took him to a nearby Walmart where he was captured by security cameras at 7:05 p.m. At 7:22 p.m., they stopped at the Durango McDonald's. Dylan sent text messages throughout the evening. Investigators say the last text went out at 9:37 p.m. 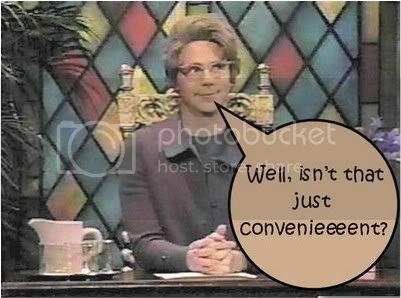 The Smoking Guns? The Red Flags? Whether or not Dyan ever set foot in father's home ... could the lack of any texts after 9:37 PM originating from a young man who was "a constant text-messager" imply that something bad happened prior to 6:30 AM on the morning of the day Dylan was reported missing. If Dylan sent out on his own after his father left the home at 7:30 AM ... set out on his own intending to hitch a ride to the home of Ryan's Grandma ... logic dictates that the "constant text-messager" would have texted his friend to inform him of the change of plans and ... it would make sense that at least one article of clothing would have been left in the home. Could it be that Dylan was abducted from the home? Not likely. Again ... not one article of clothing left behind. Please delete post 449. I messed up. Thanks. 9Wants to Know Investigative Reporter at KUSA-TV in Denver. @9NEWS @MelissaBlasius Can you post the entire interview, uncut, on You Tube? Please! @SherryGrondin @9NEWS I'm working to put the uncut interviews from #DylanRedwine story on YouTube. It's 15-20 hours of processing time. Could Dylan's negative attitude regarding the court ordered visitation with his father as well as Dylan's desire to be taken to his friend's home immediately following his November 18th arrival have outraged Mark. Could that outrage have motivated an impulsive violent reaction ... an impulsive violent reaction that could not be taken back? Evening: Dylan arrives in Durango from Colorado Springs after 6th Judicial District Judge David Dickinson issued a court order granting Mark Redwine, Dylan’s father, visitation rights during the Thanksgiving holiday. Dylan sends his mother, Elaine, a text message that says he has arrived. Elaine Redwine tells The Durango Herald that Dylan’s text message ended with an emoticon that was interpreted as a scowl. Your AntennaSearch Report is ready! Search Radius at max - 4.0 miles. No New Tower Applications Found as of 02/02/13.